Although there are a number of threads about Harry they are quite old now, so I thought a new one may get more replies. Harry Johnson pre-war service while playing for Sheffield Utd was a steel worker with my Grandfather at Hadfileds, aged around 17 they were best friends.. In late 1917 the Royal Engineers were on a recruiting drive and visited Hadfields to try and get fresh recruits- my Grandfather (Reginald John Beard) and Harry went to the presentation, the main point the RE's made was by joining the Engineers and not the infantry it would be like an extension of their careers and once the war was over it would be so much easier for them to be assimilated back into the workforce. My Grandfather recounted that both he and Harry fell for that line! Naturally, reality was a far cry from the recruiters marketing. My Grandfather and Harry had consecutive service numbers, showing they were right behind in line when attesting. Both ended up in the RE No1 Company Special Battalion - gas. They spent the next few weeks in training in Devonport, then off to France, more training in the specifics of gas warfare, then they were posted to separate Stokes trench mortar units. I won't go into detail here about my Grandfathers war service history (but will do so if anyone is interested). One notable story my Grandfather told me was of a football game in France, both my Grandfather (goalkeeper) and Harry (striker) played in an inter-divisional football tournament which their team won- more down to Harry scoring boatloads of goals than any goal keeping heroics from my Grandfather (his words not mine). On the 11th November 1918 both Harry and my Grandfather were in Paris on leave, Harry was de-mobbed days later to return to play for Sheffield Utd, m,y Grandfather spent the next 8 months in Belgium helping to supervise German POW's in rebuilding roads etc. My Grandfather and Harry remained in firm friends through to around 1945 when my Grandparents moved to Guernsey and then in 1966 emigrated to NZ. I have attached a couple of photo's to this thread, the first is of the conscripts at Devonport after basic training, my Grandfather is middle row third from left, I believe though cannot prove it that Harry is behind him, back row 3rd from left. 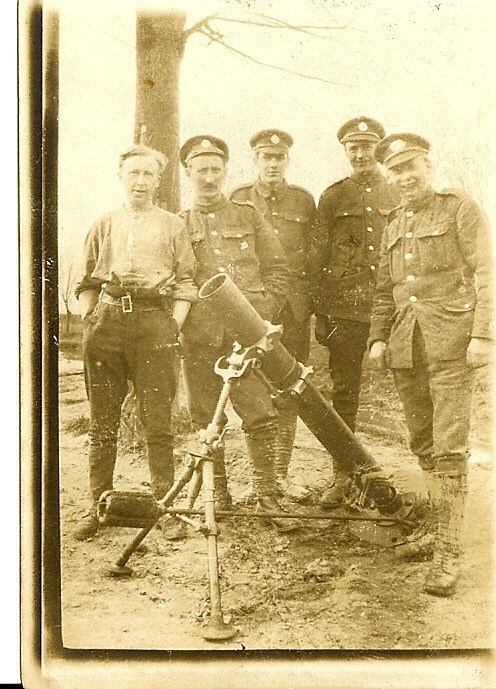 The second photo is my Grandfather in France mid 1918, 3rd from left- aged a lot in around 6 months! - note Harry Johnson is not in this photo. I know a bit about Harry Johnson's subsequent career but would be very interested to know if anyone knows of any grandchildren or Great Grandchildren of his who may be alive and interested in this story. Again is anyone would like any more detail I would be delighted to share this. Interesting, my grandfather had a similar experience. He was working at Vickers and joined the Army Service Corps, going to France in 1917. Their job was to service the artillery and transport equipment and he was always on the move. At the end of the war he was sent to a 'concentration camp' in Germany, (which meant something different then) before demob to the UK. 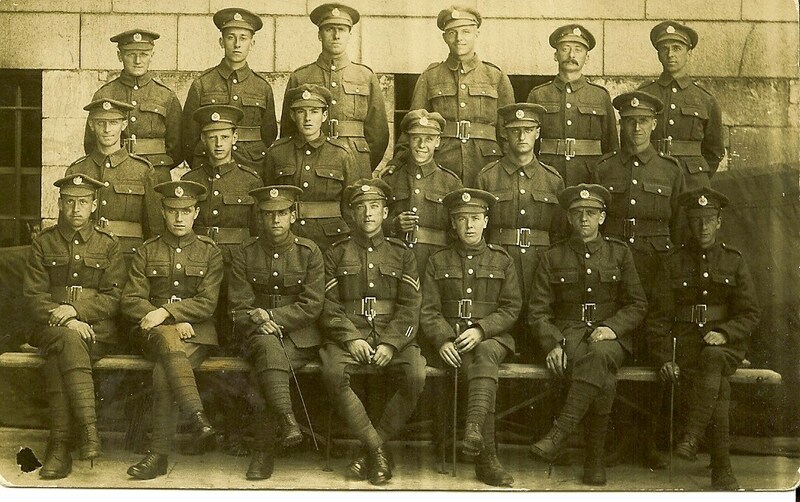 In the second photo, all the soldiers on the front row appear to be holding swagger sticks? Interesting, yes not sure why they have the swagger sticks, only one is an NCO, the rest all appear to be other ranks, I imagined that swagger sticks would be Sgt and above?